Contributory Negligence in IL Slip and Fall Cases | Hupy and Abraham, S.C.
Who will pay for my slip and fall accident injury if I was partially at fault for the fall? It depends on the unique circumstances of your fall. In Illinois, you may still be able to make a financial recovery if someone else was primarily responsible for causing you to fall. The plaintiff, or injured party, may recover damages in a personal injury case (such as a slip and fall case) if the plaintiff is not more than 50% responsible for the accident. In other words, an injured person can only recover damages from someone else if the injured person was not the primary cause of the accident. The damages that the plaintiff may recover will be reduced by the percentage of fault attributable to the plaintiff. Thus, if the plaintiff is found to be 30% responsible for the accident, then the plaintiff may recover slip and fall accident damages, but the amount of the damages will be reduced by 30%. The rule may seem simple, but the percentage of fault attributable to each party is often a contested matter in a slip and fall case. Presenting strong evidence. This may include things such as photographs, surveillance video, witness testimony, property maintenance records, and medical records. Making strong arguments. An experienced slip and fall lawyer can help persuade the insurance company or defense attorney about the percentage of fault that should be assigned to each party. Learn more about how a slip and fall lawyer may help you—even if you were partly to blame for the fall accident that left you injured. 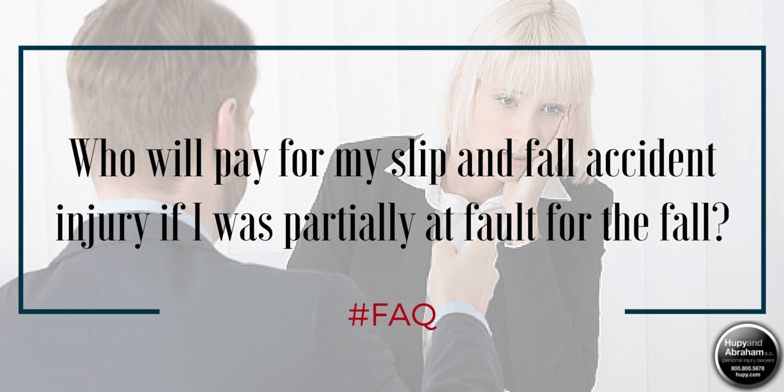 Call us at any time at 1-800-800-5678 to discuss your slip and fall case. We are available 24 hours a day, seven days a week, 365 days a year.